Our Allergy-Friendly BarkBox finally arrived, and it was a long wait! The boxes usually ship out from Connecticut on the 15th, and sometimes it takes a week or more for ours to make it all the way over here to the other coast. This box is Christmas-themed, and much more festive than our 75-degree bone-dry weather. toy. I've been meaning to get one of these for years, and here it is. This is a durable, stuffable chew toy, and I've loved all of our other Planet Dog Orbee toys. We got a SafeMade Holiday tartan bandana with Christmas trees and reindeers. It is just the right amount of Christmassy without being tacky. When I first saw the Etta Says rabbit chew, I thought it was a duck chew like the one in our September BarkBox. Happily it is a rabbit chew, so Brisbane can enjoy it. These things are kind of like bully sticks, but are odorless and won't stain rugs. The card in the box says it contains some Dogs Love Kale treats, but instead we have some Bixbi Essentials Pork Jerky treats. These are what I wished we had gotten back in our July box 'o'chicken. I'm sure everyone here will appreciate them. 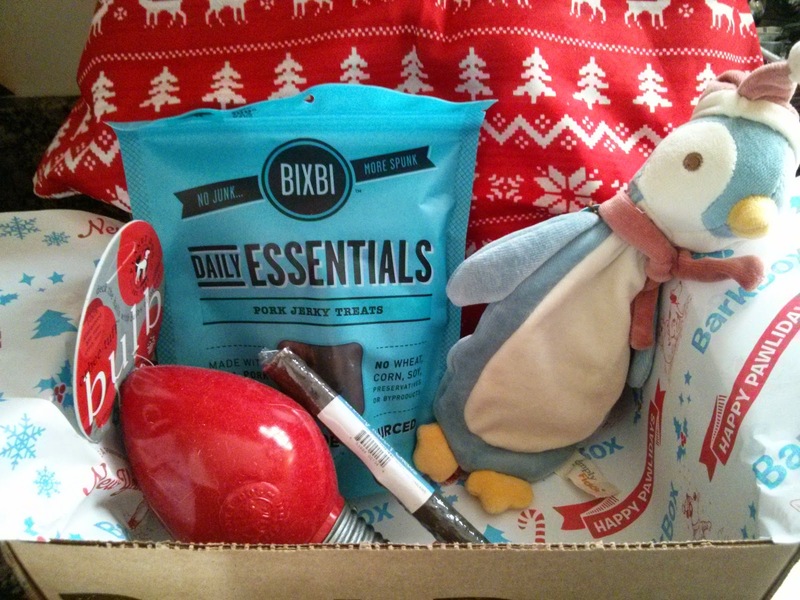 The last thing in our box is a Simply Fido Penguin, which I don't love. It's kind of cute, but my dogs just aren't into crinkly things at all.